Remove all contents from the shipping container. Remove the Cooking Grate from the Kettle Base. Slide Vinyl End Caps onto the Stabilizer Leg then position the Stabilizer Leg to the bottom of the single Kettle Leg. Adjust as necessary the Stabilizer Leg and Bracket onto the Kettle Leg until Kettle sits level. (see fig. 1) Tighten set-bolts. Take the Ring Assembly and position it inside the Kettle Base so the Ring fits into the Kettle Base so the Ring fits into the Kettle Base and rests on the Lower Ring Tabs. With the Ring placed onto the Kettle Base, attach the Shelf to the Ring (fig. 2) with included nuts, washers, and bolts. Remove the Ring and attached Shelf from the Kettle Base to attach the Hopper Box/Air-Pellet Chute. 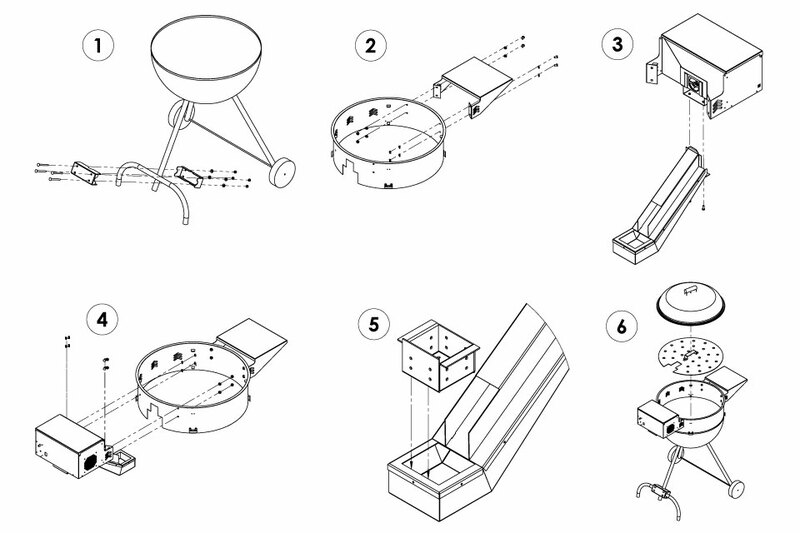 With the Ring and Shelf Assembly upside down, slide the Air/Pellet Chute into its receptacle on the Hopper Box (fig. 3) and secure 2 set screws to the air-port on the bottom of the Hopper Box. Place the Diffuser Tray on the Lower Ring Tabs. (fig. 6) This is best accomplished using a “Heel and Toe” technique by placing the diffuser tray on the two shelf-side Diffuser Tray Tabs first. Same for removal. Place the Kettle's Cooking Grate on Upper Ring Tabs and put on Kettle Lid until ready to use. (Note) See Lighting and Operating Instructions when ready to use.